Before we delve into the redesign let’s first set the stage. Amazon has aggressively tried to expand its hold on various markets for quite some time. Case in point: tablets (Kindle family), gaming (Twitch.tv, controllers, OnLive game system), and phones (Fire Phone). Let’s focus on the phone. Earlier this year they launched their own mobile phone: Amazon Fire Phone for $200. Two months later, Amazon announced they were slashing the price to 99 cents. Many argued that it was a deft business strategy to get the device in more hands and boost revenue of their apps or in-device marketing value similar to how magazines offer free subscriptions to boost subscriber count and increase advertising costs. Others, like comScore, argued that the device had very limited sales, somewhere in the realm of 35,000 units, and they were just trying to get them out the door. Earlier this week Amazon announced a $437 million loss in earnings. How much of that was due to the Fire Phone? $170 million was lost this year due to the Amazon Fire Phone itself. According to Techcrunch, Amazon has $83 million in Fire Phone inventory sitting on its shelves. The investors from Shark Tank would be livid. Ok. But why tell you all of this? 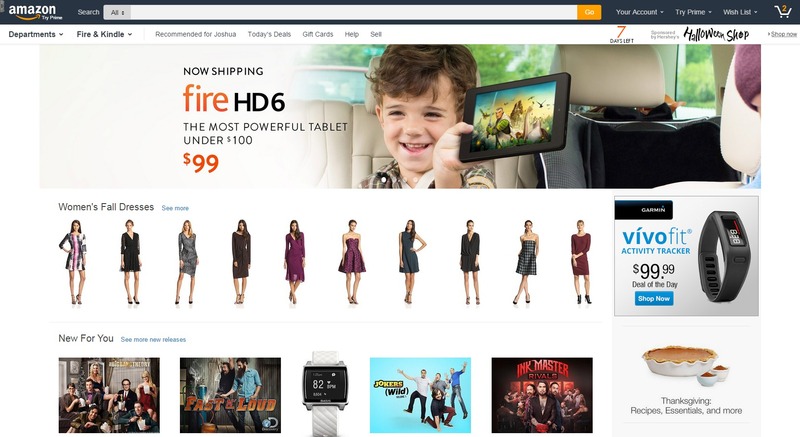 Amazon.com launched a redesign of their website this week. Aside from shifting elements around on the page, like they often do, they placed their failing product front and center on the navigation. It may seem like sound business logic…until you actually put some thought into it. Amazon.com is highly regarded for what they do with user data. They perform an incredible amount of A/B testing and user testing in general. That’s why they’ve grown to be the $20.58 billion company that they currently are. They get it. Many startups, or cash-strapped consultants, reference what Amazon is doing in the ecommerce space and then repackage that “strategy” as their own to sell to clients. Now those consultants (ie: “gurus”) see this as valid strategy. To push whatever you want down the throats of your potential consumers. You know. Because revenue. What they don’t understand is that all decisions related to digital marketing, which includes web design changes, need to be vetted. Look at your data. Review the analytics to see what people want. Make their journey easier. Cut out the extra clicks to get them into the checkout page. That’s how you increase revenue. But doesn’t Amazon customize the products you see based on your past purchases? They used to do that very well. But with this new redesign it seems to have taken the back seat to what they want to push to you. Look at the image to the right. The first thing I see is “Women’s Fall Dresses”. First, I am not a woman. Second, I have never looked a women’s clothing or purchased any on Amazon. This seems like Contextual Design 101. So why is Amazon ignoring the qualified user experience data they’ve collected? I understand some men may purchase female clothing or that some men may purchase female clothing for their significant other. But why wouldn’t Amazon showcase products I’ve shown interest in but haven’t purchased yet? Or products I have purchased and may new to refill or buy a new version of? Instead, they push women’s fall dresses. 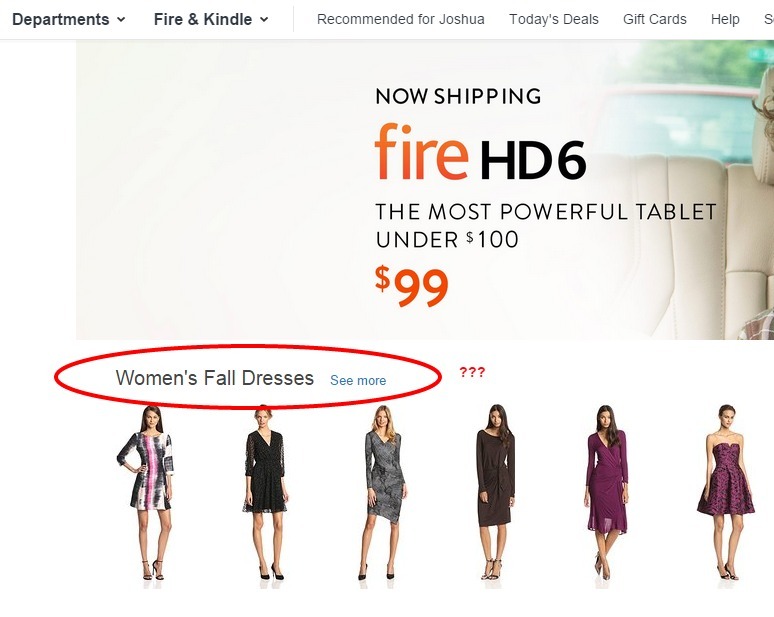 If the goal is to buy something in season related to women why not show dresses if the user is a woman but then show simple low-friction purchases like accessories for men to purchase for them? 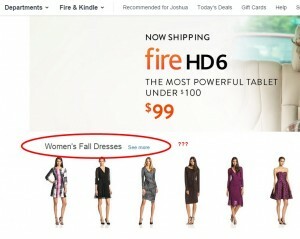 I’m curious how may men purchase a women’s fall dress. Regardless, this seems to be the way Amazon is handling the user experience of the website now. Forcing you into departments they want you to be in. Amazon Fire Phone sold roughly 35,000 units through the end of August. Let’s bump it up to 100,000 units to make this easy and hopefully more relevant to what their figures are at now. Based on this Forbes.com article detailing the estimated Kindle E-Book sales for Amazon, there were roughly 43.7 million Kindle units sold from 2007 to the end of 2013. It could be much lower or possibly higher but that doesn’t matter for this argument. Based on Amazon.com traffic data from Quantcast they are seeing roughly 80,000,000 people visit the site per month. That means that roughly .00125% of visitors own a Kindle Fire Phone while, potentially upwards of 54.625% own a Kindle E-reader. Wouldn’t logic dictate that the Kindle should be first on the drop down list? Less effort to locate relevant accessories, products, and e-books means revenue. It takes an extra second to locate the Kindle product line. That may not seem like much to you but Amazon received a lot of press for their “Users really respond to speed” presentation in 2008. They stated that for every 100ms of latency it cost them 1% in sales. That’s .1 second. Ten times less than it takes to navigate to the Kindle E-reader. Ten times less than something that has an install base 43,700% greater. Could we extrapolate that the momentum of a user’s intent to purchase is impeded by the choice of navigational structure? Latency in page load versus resistance because of design decisions are very similar to a user’s overall experience. Priority should always be focused on providing the path of least resistance to the end goal. Awesome insight and when people from Amazon read this their first thought should be, why isn’t this guy working for us. Great post! Thanks, Bill! This is also a trend I’ve experienced with clients this year. They put their business desires ahead of customer interaction and actual behavioral data. Not only when compared against standard practice but, more importantly, compared against actual behavioral metrics from their own site. Also, if you know of anyone at Amazon please share with them. I’d be happy to help them better structure some user flows. Especially with their associate network / profit sharing pages. That’s a total disaster. The new shopping experience is equally as forced and clunky. Everything is now “tiles” and you can no longer sort by / filter by and have a list result – now it’s all in tiles. This means less you can read without selecting something, and it means you can’t do a proper “list”. It’s now harder to find things, the search function seems to give what I want second (First being ads for things they want me to buy). This really isn’t a good experience at all. They made it harder to find what I want. They probably thought this was genius as now I have to stay longer on their site. Their overviews cover the screen with information I didn’t ask for, via a mouse rollover, they’ve buried all the things I want to find and are using their predictive methods to force advertising on me, as well as forcing me to see how great the amazon products are. This is terrible experience, and the desktop feel has been completely sacrificed for what I can only assume works slightly better on a tablet. Overall, I feel like I’m looking at a page full of advertising vs. feeling like I’m shopping for a need or want. I really can’t stand it, and it’s made things so painful to find – things that use to be easy. I genuinely no longer enjoy going to amazon to browse and read reviews. I think you nailed it, Ryan. Somewhere in the last 12 months they’ve decided to change course and focus on very specific revenue models: their own products. That’s not a huge stretch and is fairly common in all industries. The issue is more so how they accomplish that. Show me ads for your products, or related products, all you want but if that’s what I see first and foremost above what I literally typed in then we have a problem. It’s no longer about my needs as a customer. It’s about Amazon’s interests to gain market share in their new platforms.